Snow and ice pellets have snarled traffic on the Burlington Skyway, shuttered schools and interrupted city programs as a winter storm continues to slam Hamilton. Provincial police warn commuters who are preparing for the journey home to take it slow. "We are still handling snow, freezing pellets and rain right now," said Sgt. Kerry Schmidt. "It will be like this for the rest of the day." He warned drivers to follow specified speed limits on the wet, dirty roads. 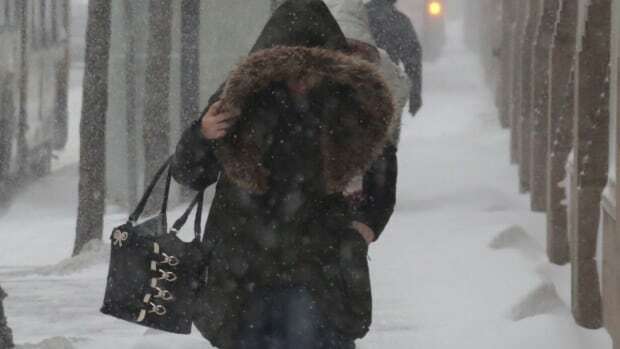 Hamilton's public and Catholic schools, along with Mohawk College and McMaster University, were closed Tuesday after Environment Canada issued a winter storm warning for the city. Local libraries and programs run by the city were discontinued when the weather deteriorated, while waste management was delayed and public transport experienced delays. Fort Erie-bound traffic on Skyway was also blocked for about two hours before a crash was cleared. The weather agency says: "Winter conditions are expected to be winter. A winter storm with a combination of 10 to 20 cm of snow, ice pellets and freezing rain is expected today." Environment Canada says that strong eastern winds go up to 80 km / h are also expected. The agency warned "snow and local blowing snow" would start on Tuesday morning. Snow is expected to turn into ice pellets and then freeze rain in the afternoon. Freezing rain can persist for several hours before it changes to rain or snow in the evening. " Total snowfall and ice pellets of 10 to 20 cm are possible before we finish Wednesday, the agency says and the storm is associated with a "Colorado Low that will cross southern Ontario tonight until Wednesday." CBC reporters Sam Craggs and Jasmine Kabatay take a trip around Hamilton on the snow day. Hamilton-Wentworth District School Board: All schools are closed and transportation canceled. Hamilton-Wentworth Catholic District School: All schools are closed and transport canceled. Mohawk College: Closed. All training courses are also interrupted. Brock University: Closed. All daytime courses and activities planned for today have been canceled. School officials monitor the situation and will announce evening classes and activities at noon. 15:00. Halton District School Board: Closed. Halton Catholic District School Board: Closed. HSR experiences delays on several routes and DARTS sees "significant delays". Riders get to know more time to get there they travel. #HSRAlert: We experience delays on several lines due to weather and road conditions. Please leave extra time to travel. Be careful #HamOnt! The city says "Crews have been out all night to prepare the transient storm – monitoring of weather and weather and focusing on applying de-icing material along the way and preparing equipment for use. to see the progress of our winter sports vehicles. " All courses in the Fort Erie-bound QEW blocked the Burlington Skyway for about an hour, but the road was cleared around 11:30 and resumed. Clinical services at the Waterdown Sexual Health Clinic, Notre Dame Youth Shelter and on the AIDS Network are discontinued today due to the weather. Hamilton Public Library: Closed. All programs, events and Bookmobile stops are canceled. YWCA Hamilton: YWCA Hamilton MacNab Street is closed and all non-essential YWCA Hamilton programming canceled. YMCA: All YMCA clinics throughout Hamilton, Burlington and Brantford are closed today. Environment Hamilton: Stop Sprawl workshops planned for tonight have been relocated to February 19 at 17.00. at the environment Hamilton office on 22 Wilson Street. Hamilton Conservatory for the Arts: All classes are canceled. Red Hill Family Center: Open, however, taxi service canceled. Macassa Lodge: The Adult Day program is open. The city warns of "dangerous conditions" along the Waterfront Trail in Stoney Creek. High waves and ice building from Lake Ontario mean that people should avoid using the track from Burlington Lift Bridge to Millen Road. Disposal: Delayed. All recovery collection will be completed. Junk and green cart pickups will take place in the lower city. Dundas & Flamborough pickups are delayed. The city says that "If it is not collected no later than 6pm, please bring it in and post it at 7am." Place the heaviest items on top of the blue box to weigh down lighter objects. Stand up paper or cardboard in the blue box instead of laying it flat. Store recyclable material under the edge of the blue box. Do not use a dustbin – use a bag so that the container does not blow when empty. Residents who want to keep their recycling to their next planned collection date can do so according to the city. There is no limit to how much recycling can be put out every week.